Coffee...? What on earth does coffee have to do with berets? Fair question, but when based in the Coffee Capital of the World, being ardent lovers of good, fresh ground - fresh brewed coffee ourselves, there is a lot of sense in the combination. Like all material pleasures on this planet, it all comes down to quality. You visited this web site to find quality (in berets) and there is similar quality to be found in coffee. We're not talking Fast Food-all the coffee you can drink outlets, big multinational coffee roasters or the aluminium wasting Nespresso syrup-cups; we're talking the daily roasted, fresh ground, hand-selected, artisan coffees of small businesses of which there happen to be a whole lot in Wellington, NZ (and the trend is growing, world-wide). One thing to have your 'shot' at a beautiful location, relaxing in the sun at the waterfront or in a dim lit lounge with Tom Waits on the background, but many people's reality is that if often doesn't work like that. And coffees-on-the-go have some definite disadvantages. Who hasn't struggled with a too broad insulated cup that didn't fit your car's standard cup holder; hasn't burnt her lips on the boiling hot rim of a metal cup, cursed the hot liquid dripping from between the cup and the lid on his lap while driving..? 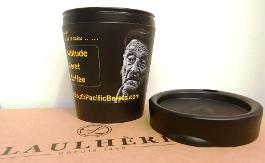 That's where South Pacific Berets' ABC Coffee Cups come in. The first and only insulated coffee cups I ever found (believe me, I tried a good number) that don't affect the taste of coffee in any way, are extremely well insulated (hot on the inside - cool on the outside), fit perfectly well in any standard car's cup holder, don't leak or drip and are totally fashionable for beret wearers of any kind! Cost: $ 18.40. Buy one (or more) in combination with any beret and pay no additional postage.